Sometimes…life throws us moldy cauliflowers. In our crisper bins. Yuck. And when it does. We should not make moldy cauliflower-ade. No, really. Please don’t do that. Moving on is tough, I know, but we just need to throw that promiscuous Brassica into our garbage can (cavorting with a fungus…the NERVE) and start scouring our fridge and wall storage units for any and all veggies that could replace the aforementioned now-green-and-fuzzy cauliflower in the recipe that we had our hearts set on making. Brussels sprouts and potatoes? Yes, I think they’ll do. This dish has a lot of great components in it. Crispy crunchy breadcrumbs. Buttery sweet raisins. Salty briny capers. Fried almonds. And the smoky flavor….of GravyMaster. I was sent one of these little bottles to try and at first I had no idea what to do with it because of, uh, the whole meat-free apartment thing. But then I discovered that GravyMaster can be used for so much more than just gravy! Oh yes, it’s a great addition to all kinds of sauces and marinades…and in this case to add a nice caramelized smoky flavor to the roasted Brussels sprouts and potatoes. Also, I know a lot of you will be roasting meats this holiday season and this little brown bottle is a great trick to help you Master the meal and add some wow factor to whatever you’re cooking up! So tell me, what would you make with Gravymaster this holiday season? 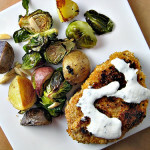 As for me, I think I’m going to whip up another batch of this brussels sprout and potato dish and call it dinner. Even without a certain unruly white vegetable in the picture, it just seems like the delicious thing to do. Before we get to the recipe, there’s one order of business we need to attend to, and it’s an important one. The moment you’ve all been waiting for, in fact. Yes, that’s right. It’s back. With a vengeance. What is it? Basically, Eat.Live.Be. is an online support group of bloggers and blog readers whose aim is to help each other reach their healthy living goals. Each week we’ll post about a topic from a specific type of media that has inspired us in some way (you’ll see what I mean in a second) as well as share as much or as little as we so desire about our goals and what we’ve been doing (or not doing, as the case may be) to reach them. We will also be posting a motivational quote or image. 1) Lose twenty pounds. This will put me at a happy and healthy weight. 2) Run (another) sub-four hour marathon. I think losing the weight will help me with this, as will continuing to take lots of strength training classes at the gym. 3) Stop the emotional/binge eating. There. I said it. It happens. And it’s not just me. I’m sure many of you know what I’m talking about. You eat one thing that’s not-so-good and then you feel guilty, which causes you to spiral into an eating-everything-in-the-fridge spree. And then you feel even worse the next day. And the cycle continues. The only way I can stop this is to not let it start. Work-in-progress. How. That is the big question, now isn’t it? For a long time I was a calorie counter. It took a long time for me to stop being a calorie counter (though I still do occasionally calculate the calories of the things that I eat for dinner, just to keep myself in check). I have no desire to go back to being a calorie counter. None. At all. But Weight Watchers Points? Those are magical mystical abstract things. I have no idea what they mean or where they came from. There is no guilt attached to them. I just know I should eat a certain amount every day and if I do, I will lose weight. It’s easy. Especially since I LOVE exercising and do it with a vengeance. (And you get to eat more points if you exercise! Nice.) Even though I’m not officially allowed to run again until December 29th, I’ve been hitting the gym 6 days a week to make sure I stay in shape enough to be able to pick up where I left off. And if I can keep off the holiday fifteen in the process…that would be even better. The real challenge is proving to be not pretending the five thousand points I ate in chocolate chip peppermint cookies don’t actually exist. Like I said. Working on it. Okay, so. The theme for this week is “magazine”. 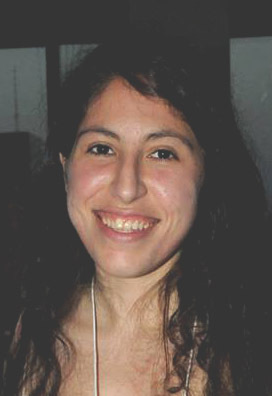 I spend a lot of my time in lab perusing the scientist’s version of the magazine – the scientific journal. A few weeks back, I came across this article in the British Journal of Nutrition comparing the antioxidant effects of cooked versus raw Brassicas (cauliflower, cabbage, brussels sprouts, broccoli). I know there is a lot of debate over whether cooking leeches nutrients out of vegetables, but happily enough…there is actually NO difference, at least in terms of antixodative effects! Not only that, but this provided hard and fast proof that eating cruciferous vegetables such as the brussels sprouts in the recipe below WILL help protect you against cancer. Can you think of a better reason to cook this tonight, other than the fact that it’s delicious? Cause, uh. I can’t. If you want to join in on Eat.Live.Be. then PLEASE either write a post about it (if you are a blogger) and let us know that you did in the comments, OR (if you are not a blogger) tell us about your healthy living goals in the comments! Preheat oven to 400 degrees. 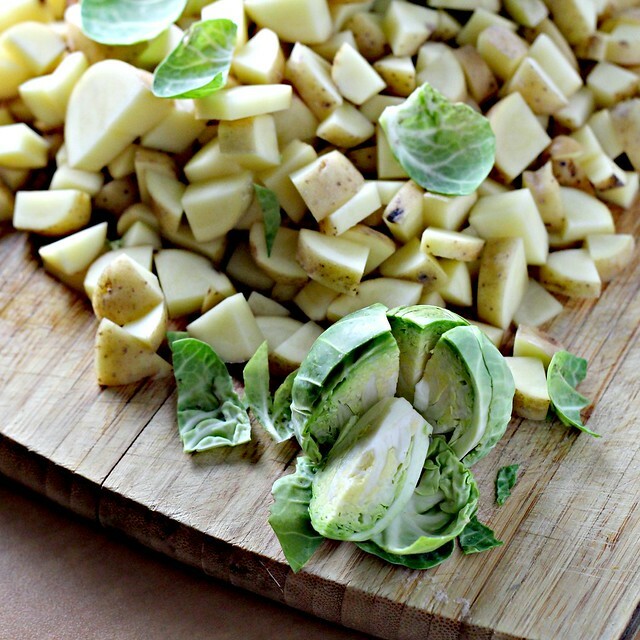 Cut the brussels sprouts and potatoes. Place a large skillet over low heat and add one tablespoon butter. When it has melted, add bread crumbs and toss until toasted and golden brown, about 3 minutes. Transfer crumbs to a plate and wipe out pan. Return pan to medium heat and add one teaspoon olive oil. Add almonds and toss until lightly browned, 2 to 3 minutes. Season lightly with salt and pepper to taste. 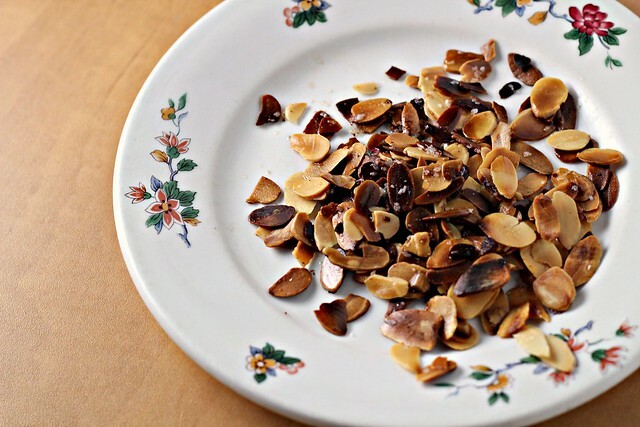 Transfer almonds to a plate. Wipe out pan and return to medium heat. Add remaining one tablespoon olive oil, brussels sprouts, and potatoes. Sauté until lightly browned on both sides. Add 1 tsp Gravy Master, if using, tossing to coat. Line a baking sheet with parchment paper. Add the veggies to the pan and roast 12 minutes. Raise oven temperature to 450 and roast another 5 minutes or until tender. Meanwhile, in a small saucepan over low heat, melt remaining 1/2 tablespoon butter and add raisins, vinegar and 1 tablespoon water. Simmer until raisins are plump and soft, about 5 minutes; drain and set aside. 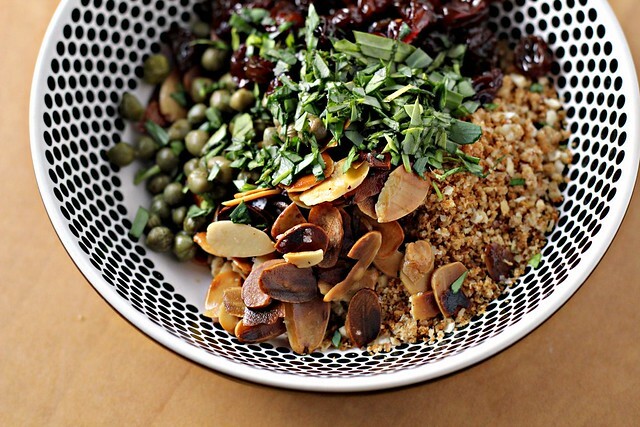 In a small bowl, combine almonds, breadcrumbs, capers, raisins, parsley, tarragon and chives. Season with salt and pepper and toss to mix. 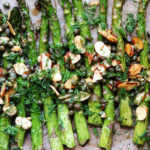 Arrange roasted veggies on a serving platter. Spoon almond-herb mixture evenly on top. Serve immediately. Pork Schnitzel with a Roasted Potato and Brussel Sprout "Salad"
Very interesting brussel sprout dish – lots of different flavors and textures! Oh goodness, this looks amazing. Best wishes on your goals — I’m sort of jealous that you can say that you LOVE (all caps no less!) to exercise. I don’t quite know how I missed the boat, but I just don’t seem to enjoy it. Maybe I haven’t done it long enough to get there? Best of luck with your goals, Joanne! I know you’ll do well! You seem like the type of person who sets her mind to something and gets it done. 🙂 Looking forward to hearing your progress!! This looks amazing. I am a sucker for anything with brussels sprouts! I think that the sprouts and tatties make this more a meal than just cauliflower – though I have cauli in my crisper so thanks for the reminder to watch it – maybe a simple meal like this might be a good use for it tomorrow night! I’m such an emotional eater. Kudos to you for your goals! I so rarely make salads with brussels sprouts. I usually stop at just roasting or glazing. Lot of flavor with the sprouts, and textures, looks so good. I love brussel sprouts! This looks like a great way to use them. I’ve never heard of gravy master before, but this dish looks fantastic. I’m all over the Eat.Live.Be. REBOOT idea. We decided about a month ago to simply NOT go nuts this holiday season. I am really enjoying not having the sweets in the house this time around. I feel better and I haven’t missed all of the baking nearly so much as I thought I might. 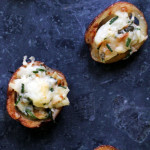 So what if I’m the only girl I know posting vegetable recipes 4-5 times a week through December? It’s what I’m eating; so it makes me happy to keep track of the recipes by posting them. Have an AWESOME day! I am on the same loose 20lbs regiment but realized that exercise especially running and yoga ground me. I am less hungry, more tired so get plenty of rest and do not eat bc of overtiredness and of course deal with emotional eating. Hopefully you can run zoo or try some yoga. Btw 20 lbs off you? Isn’t that little much? Anyway love the dish thank goodness for rotten cauliflowers. I love the reboot idea too! I just gained 20 lbs. Seems like over night and am so eager to lose it, and more! I have to write down everything I eat, it’s the only way I succeed. Obviously I haven’t been doing that. I so have to start up again. Starting today? Hopefully! I love this quote!!! A great way to kick of eat.live.be!! I have never heard of gravy ,masters, thanks! What a great combination. Perfect to start your eat, live, be. I have actually never cooked bruessls that were fresh. Sad, yes. Maybe I should add that to my December fun list. I’ve gotten better with binge eating since living w/ my bf.. I don’t want him to know… probably not the healthiest way to solve problems, but it works for now. Lol, sounds like the moldy cauliflower in your crisper conspired with the lost brown broccoli I found yesterday! 🙂 My mom swears by gravymaster — she never makes a gravy without it! Brussels and cauliflower – two things that so many people hate, but that I LOVE. I’ve decided that most people have either never had them fresh, or never had them seasoned well. Are you with me? And also…where are these 20 pounds going to come from, my dear? Hmmm? ‘Cause when I saw you, I didn’t see no stinkin’ extra 20 pounds. I really enjoyed your post this morning! Even though I’m dubious you even have 15 lbs to lose, being the work-out machine that you are. But whatever your goals, I’m behind you! And if Brassicas help reduce risk of cancer, bring ’em on! 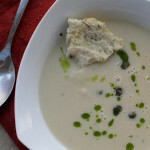 We have cauliflower soup last night, and next week I’ll put brussel sprouts on the menu (with bacon and nutmeg, mmmmm).
. . . HAD cauliflower soup last night. had. Right. I made brussels sprouts last night and they were heavenly. Roasted brussel sprouts may be my currect favorite vegetable that has me 1) anxious for lunch (leftovers!) and 2) wanting to make this STAT! 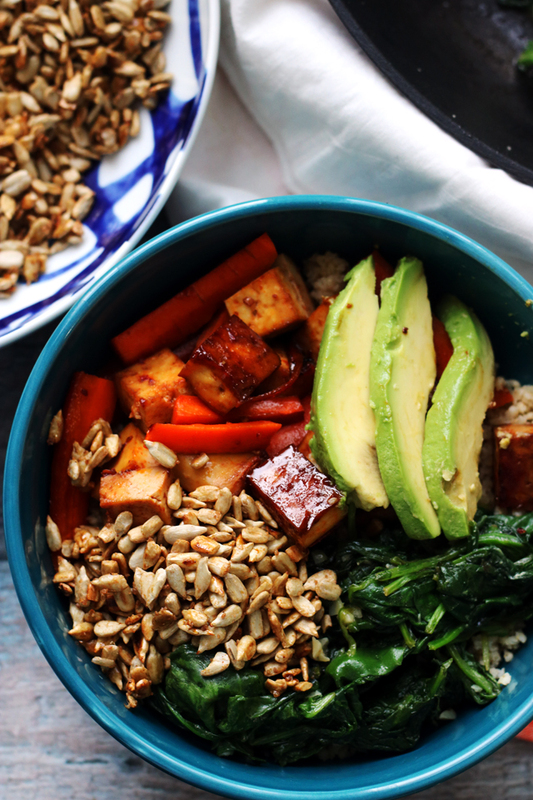 Healthy combo and looks very tasty! First I want to say, I love the brussel sprout potatoe combo. So many different flavors, I’m not a fan of brussel sprouts, but I am betting with all these flavors and the additiona of potatoes, I would love it. I’m glad to be apart of Eat.Live.Be. I need help to reach my goals. My goals are pretty close to yours. I was a calorie counter, and honestly I think I maybe slipping back, I find when I eat bad food I count calories, so I don’t over due, but now I am trying to stop again. It’s such a bad addiction, and if you start to calculate you just can’t stop yourself. I have been exercising, which is ok, I don’t love it, but always feel good when I do it. I want to tone up, I see I am starting to gain weight and that scares me. Plus I noticed I have been binging on sugar, I know I’m doing it and I know it’s wrong. I told myself to do the best you can for December, and start fresh and new in January. I know this week on my blog it’s been sweets, and I may post a few more, but otherwise I’m going back to healthy dishes and focusing more on veggie dishes. I am looking forward to a healthier happier me! This fall has been rough for me – super stressful all the apps and all – and I started again with the emotional eating. And paying for it now… even though it was still healthy foods (oh, except maybe that Luna bar binge)… but yeah, I’m with you, figuring out how to control the emotional eating. Fix the stress first, and even if you can’t, don’t solve the stress with food. 😛 Anyways, my goals are to go back to calorie counting (I know that is terrible but it makes me certain I am not undereating) and completely removing sugar (except for fruit in the morning). I found I got hooked to the sweet stuff and then it kind of spiraled out of control. So now it is bring on the veggies!! I managed to use up my cauliflower before it molded. I don’t know if the baby bok choy in there right now will be as lucky. Thats a lovely combination. Looks so delicious. Beautiful combination of ingredients Joanne! Brussels sprouts are very dear to me although I don’t get to eat them so much lately because they are accused of This dish though would definitely tempt me to try it! A good selection of components that go well together. Bob loves his Brussels sprouts, however he doesn’t want them fiddled with. I may have to fiddle anyway, see what he says. I just got a wack load of these from the farmer we shop at. I love the mix of sweet and salty, and the crunch. Beautiful too. Is this going to be on your Christmas table this year? First of all, moldy veggies always make me very upset but at least throwing them away means more room in the fridge? Second, if you lose 20 pounds you might disappear! But I am so with you on number 3! A dietitian recently told me, “whatever you ate before, eat half of it now.” Best advice I’ve heard lately. Your dish sounds great; I love the caper, raisin taste going on! Good luck on your weight loss! Ok. What’s in that stuff anyway? It’s crazy to think you want to lose 20 lbs because you’re so active! Then again we’re only blogging friends so I might just be imagining you as this ultra thin veggie lovin runner who I’m super envious of because you look awesome in those stretchy running pants. Although I secretly believe that’s all true . . . I absolutely LOVE that quote! So perfect for this time of year…a cautionary thought to keep in mind. I love all the flavors and textures in the dish,Joanne! Beautiful dish for the holidays! Well, I have never even heard of Gravymaster…but that dish looks mighty tasty. I love all of those flavors and textures you have going on there. Delish! Yum! I want to eat this dish right now! The recipe looks delicious. I’m curious as to what’s in the gravy master! 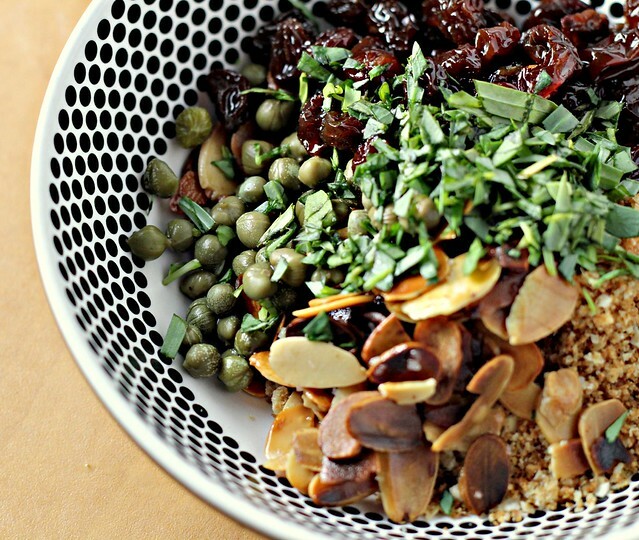 The brussels sprouts, almonds, cranberries, capers…wow, what a mix of flavors. I can dig it. Cheers to you on your healthy living goals. Oh it is always such a treat to come to your blog! This looks delicious!! great goals! i would love to run a race, i’ve only ever done a 5k. these brussel sprouts look amazing, and i love the use of the gravy master, YUM! That Gravy master would be very useful in my kitchen! Those sprouts look awesome! I won’t be able to get the Gravy Master in Belgium, but maybe I’ll come up with an alternative. Delicious! Brussels sprouts are one of the favorite vegetables. Love separating the leaves for a nice salad. I would love to be part of it!! Is there a link or further details on how to do so? Do I just blog a post? haha. I’m confused!!! Please let me know. This dish looks out of this world. 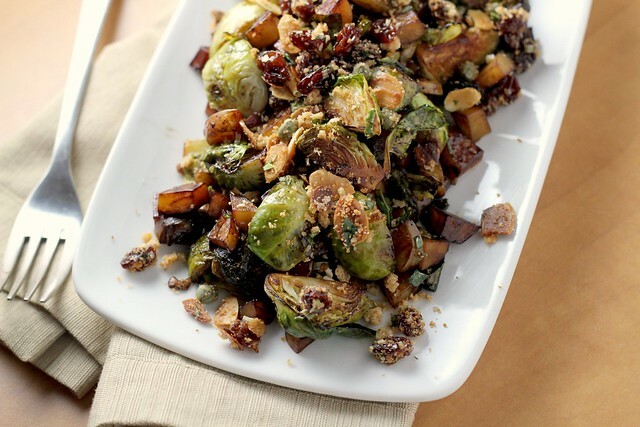 Love the idea of mixing brussels sprouts with potatoes, and almonds in anything are fabulous in my book! i could use this right now! That quote is PERFECT!! Who needs cauliflower when you can make this tasty dish!?! wow so much going on tht plateof goodness all my fav ings in tht….looks gorgeous! 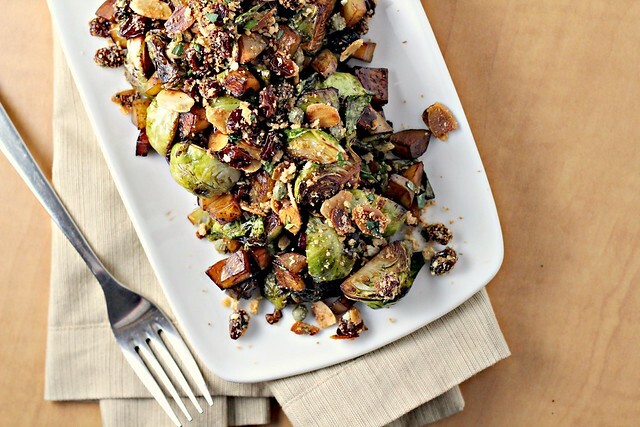 Love,love,love Brussels sprouts and with potatoes and fried almonds sounds amazing! That dish almost has me wanting to try brussels sprouts again to see if I could like them. It sure has a ton of good things going on in it. 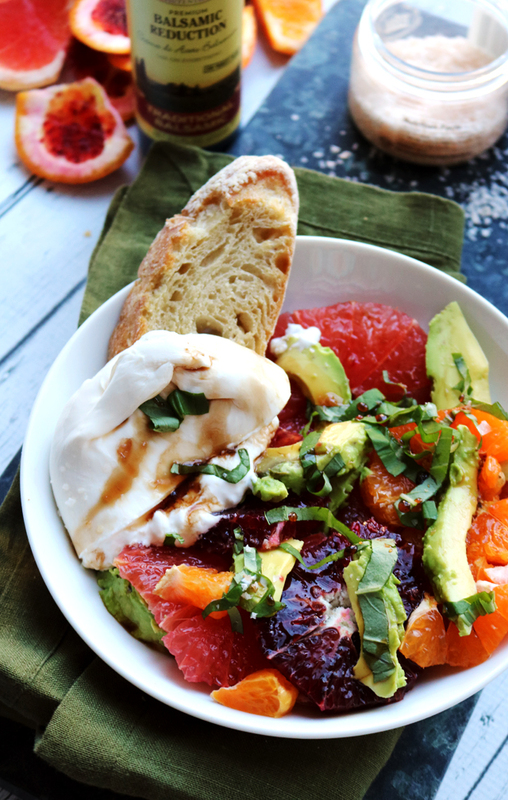 Loving the sweet-salty flavors of this dish. Plus, I can never get enough of Brussels sprouts at this time of year. You pretty much can’t go wrong with brussels sprouts, but adding potatoes and almonds totally seals the deal. Im surrounded by only crappy airport food right now and you’re making me so hungry! Those are the most delicious brussels sprouts I’ve ever seen! Love how you dressed them up. And hello fellow Weight Watcher! It’s good to know a fellow blogger is counting points too. Healthy eating and Christmas. Hmmmm. Not sure I an do that. Then again, I’d eat a lot of this dish. All kinds of fun flavors and textures going on, here. I can’t tell you how many Jalapenos have disintegrated in a corner of my veggie bin. Not pretty, and frustrates me to no end. I love to exercise, too. When it’s warm, and I can swim outdoors. Water and me– yeah. Land. Nope. Too hard on these arthritic knees. You are a great inspiration, though. Good luck with your marathon! 😉 And losing weight! haha…is there anyone NOT familiar with binge eating? 😛 I’ve never heard of Gravymaster before, but it sounds very tasty! As does this brussels sprouts dish, of course! For some reason I can never resist anything with Brussel sprouts. Good luck with everything! I’m in LOVE with the Brussel sprouts recipe. Ooh, the dreaded vegetable crisper clean-out. I did one of those the other day and found some fungus at the bottom too. However, I do have some fresh young brussels sprouts awaiting a recipe, and this just might be the one! I love brussels sprouts and am bookmarking this recipe – never tried Gravy Master before, but sounds interesting. Love the Eat.Live.Be series! I can’t WAIT to make these cookies!!! 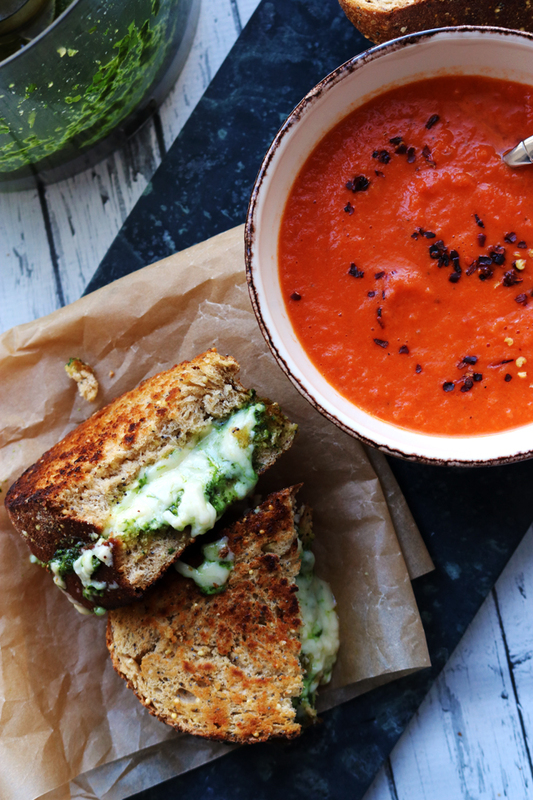 This looks mouthwatering-ly good. 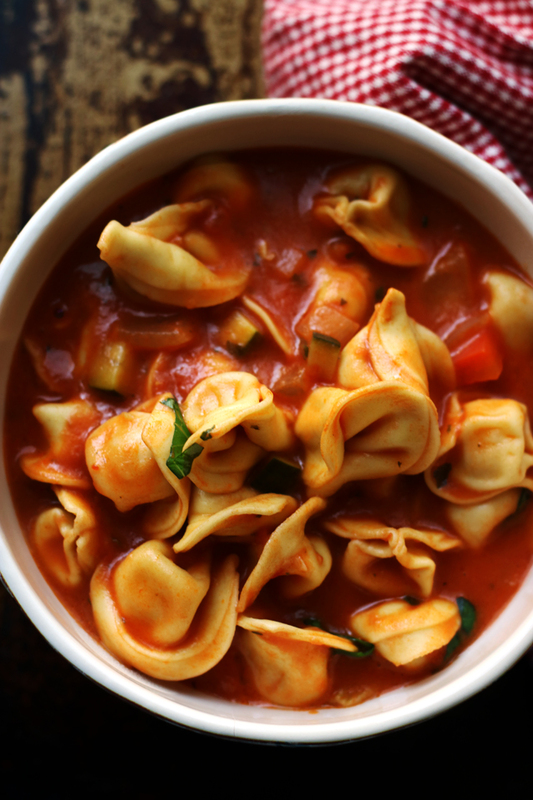 I love all of those delicious ingredients and you made them look so amazing together. Num! Joanne, I have a friend that gave me her recipe for French Onion Soup. In it it said to add 1/2 teaspoon of the Gravy Master. I even called her to make sure it was right and she told me that was her secret ingredient. I must say it adds a beautiful color to the soup and it really is delicious. I wish you were bringing this tomorrow. Even though it’s not cookies. Weird that I love veggies *almost* as much? First of all, this dish sounds wonderful. What a creative way to use the Gravy Master! And you are inspirational. It’s an uphill battle to get in shape – and I think you are way better than you give yourself credit for! And I don’t think you have 20 lbs. to lose!! !